The Dual LEAF has all of the proven features of the original LEAF, but with more pulling power. With two Cummins QSX15-L3 600 hp gensets, it can achieve higher speeds and provides built-in backup power. 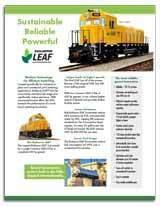 Both models of the Railserve LEAF were created specifically for port, mining, industrial in-plant, and commercial yard switching (shunting) applications. The Railserve Dual LEAF Gen-Set locomotive maximizes tractive effort while minimizing fuel costs and emissions. Railserve LEAF® locomotives reduce NOx emissions and particulate matter by 84% and meet EPA emissions standards for Tier 3 diesel engines. For every 50 gallons (189.3 liters) per day of diesel not burned, the LEAF reduces GHG by 400,000 lbs. (181,437 kg) per year. Tier 4 units are now available. The Railserve LEAF® locomotives reduce fuel consumption 45–72% over a conventional locomotive. Railserve LEAF® locomotives are built with readily available parts, making future maintenance easy and cost effective. The Railserve Dual LEAF is powered by two Cummins QSX15-L3 600 hp gensets. Packages available to meet EPA emission standards for Tier 2, Tier 3, and Tier 4 diesel engines. The proven track record of the Railserve LEAF in numerous switching operations makes this competitively-priced locomotive an exceptional value for any rail yard. Learn more about how the Railserve LEAF can increase efficiencies and reduce costs in your operation. Please contact Railserve today. Railserve tracks fuel consumption of its genset and conventional locomotives. The Railserve LEAF® locomotive is designed to minimize fuel usage, reduce emissions, and exceed the performance of a conventional locomotive. Railserve LEAF locomotives have been in operation at Railserve sites since 2008. Fuel consumption in comparable operating circumstances results in a 72.5% savings in fuel costs. *Each switching operation will have unique locomotive operating demands. 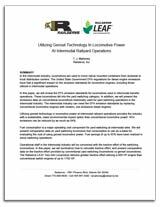 See our white paper on EPA standards & data comparing genset and conventional locomotives. As seen in Progressive Railroading.